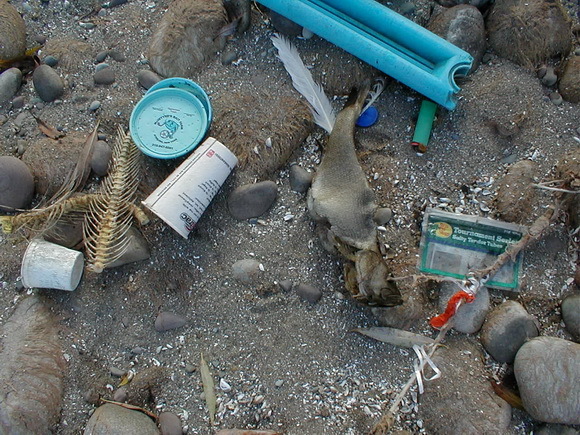 How many kinds of plastic can the kids find on this beach? Number 3 on Sid and Richard's list for helping our waters is “Avoid using extra plastic and plastic packaging when possible.” This is especially important since Wayne County has privatized its public recycling program's curbside pick up of plastics and other recyclable material. There are several reasons why we should reduce use of plastics. As Sid says, “chemicals associated with plastic manufacture and degradation cause us water folk trouble. They're bad for humans, too.” The chemical stability that makes plastic so useful – it's tough and cheap and doesn't rust or rot- also makes it hard to get rid of. A few years ago an ocean racer on his sailboat 'discovered' a giant patch of floating plastic in a remote and little traveled part of the Pacific and proceeded to make a lot of noise about it. Before long scientists had confirmed his find really did exist. The great Pacific trash vortex as some like to call it, mostly consists of tiny bits of plastic that have gradually been broken down from trash by U V energy and physical action. Chemicals leach from these bits into the water and enter the food chain. The little bits are also eaten by the small creatures of the open ocean plankton community. There appear to be large trash patches in several of the world's oceans. I remember being amazed ( and grossed out) by all the tiny pieces of Styrofoam in my plankton samples from the Merrimac River back in the 70's. I wondered then if the baby fish ever ate them. It seems that they and other animals do. There is a photo I've seen on line and in at least one boating magazine of a long dead albatross chick photographed in its nest on a Pacific island. Bones and feathers lie around a group of plastic bits including something, possibly a magic marker, that had clogged up its gut and killed the poor bird after it's parent fed it “food” from the ocean surface. Closer to home there is plenty of plastic washing into Lake Ontario, too- just check any beach and you'll quickly find something plastic-toys, paintbrush handles, old school hair curlers, shoes, container seals, black pipe, decoys, - and balloons. I always find at least one balloon if I walk the beach for long. Once, while on a cruise, we started picking up deflated balloons that we saw as we motored along. Within a few hours we had picked up six. A day or two later we picked up several more. It's a good bet that on any given day during the summer, hundreds of balloons are slowly breaking down and fouling our water. The manufacture of plastics also releases chemicals into the environment. One chemical, Bisphenol A, has been shown by a number of studies to have impacts on human development and health ranging from miscarriages to cancer. So the best way to protect our water ( andour health) is to avoid using plastic wherever possible so that less plastic will be made and less will be tossed out. And, as Sid and Richard ask, NEVER burn plastic and ask your neighbors not to. It is illegal and very unhealthy for everybody's air, soil, and water. In our household one of the biggest sources of plastic is packaging. Buying in bulk or at farm markets is one way to reduce plastic use. I find the Styrofoam trays in our produce department particularly aggravating and unnecessary as they can't be recycled. HOW # 3 Helping Our Waters adapted from Twinkle Toes and the Riddle of the Lake - find it at Amazon as a Kindle book or at www.chimneybluff.com. 0 Comments to "HOW - Helping Our Waters #3"